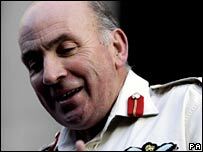 The new head of the British Army, Chief of the General Staff General Sir Richard Dannatt, has told the Daily Mail that UK troops should withdraw from Iraq "soon". He said their continued presence "exacerbates the security problems" in the country. Here are more key quotes from the interview, followed by a statement he made later to further explain his position. "We are in a Muslim country and Muslims' views of foreigners in their country are quite clear. As a foreigner you can be welcomed by being invited in a country, but we weren't invited certainly by those in Iraq at the time. "The military campaign we fought in 2003 effectively kicked the door in." "The original intention was that we put in place a liberal democracy that was an exemplar for the region, was pro-West and might have a beneficial effect on the balance within the Middle East. That was the hope. "Whether that was a sensible or naive hope, history will judge. I don't think we are going to do that. I think we should aim for a lower ambition." "History will show that a vacuum was created and into the vacuum malign elements moved. The hope that we might have been able to get out of Iraq in 12, 18, 24 months after the initial start in 2003, has proved fallacious." "I don't say that the difficulties we are experiencing around the world are caused by our presence in Iraq, but undoubtedly our presence in Iraq exacerbates them." "There is a clear distinction between our status and position in Iraq and in Afghanistan, which is why I have much more optimism that we can get it right in Afghanistan." "It was tough: three of his contemporaries, young officers, have been killed. There is a lot of pressure on young commanders. When my son was deployed he got into some quite hairy situations. "I am still a dad as well as being Chief of the General Staff. I wouldn't send an army where I wouldn't send my own child." This is the full statement released by Sir Richard Dannatt on Friday. "We have been in Southern Iraq for three and a half years and we have made significant progress, with two of the four provinces now handed over to Iraqi control and our responsibilities are much reduced in one other province. "The point that I'm trying to make is the mere fact that we are still in some places exacerbates violence from those who want to destabilise Iraqi democracy. "Currently Operation Sinbad is trying to make Basra better and a lot of British soldiers are doing a really good job. In that regard, their presence is helping but there are other parts where our mere presence does exacerbate, and violence results. "But that is not a reason for us to leave. I am on record publicly saying we're standing shoulder to shoulder with the Americans. "I am on the record from a speech three weeks ago saying that I'm planning force packages in Iraq through 2007 into 2008. I'm a soldier - we don't do surrender, we don't pull down white flags. We will remain in southern Iraq until the job is done - we're going to see this through."